These herb towers are perfect for that person who only has a small space to plant! If space is a consideration, don't miss out on growing fresh herbs yourself. Just try this simple idea and the benefits are HUGE! Tools & materials: 5 - terracotta clay planters, potting mix & herbs! This planter has rosemary, sage, parsley, thyme, oregano, basil and chives. All easily available at garden nurseries and all wonderful used in cooking. Of course you can use any herbs you desire and there are some pretty great one that are both unique and tasty! 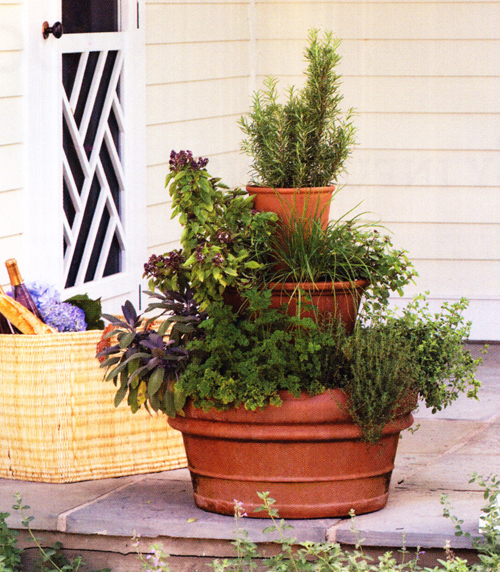 Simply place the largest planter in the location selected from the herb garden. Center 1 small pot within, upside down with at least 6 inches of space around the inverted pot. Fill the ring between the two with potting mix. 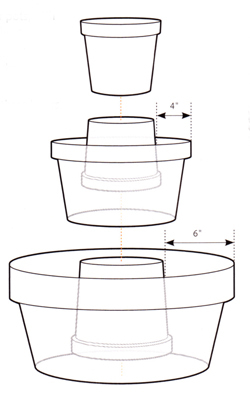 Repeat to create a second layer with 2 small pots, with 4" between them. Place a final pot right side up on the second inverted pot and fill with potting mix. Plant the herbs of your choice in all three layers. FUN! Read more.....How to make this fountain out of pottery! Read more.....Make a chair planter! Empty Pots - Yeah...Empty Pots! 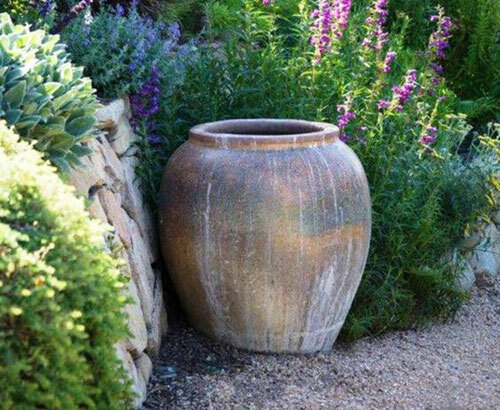 Have you ever noticed how beautiful a pot can look left completely empty in the garden? Perhaps you think that a garden pot left empty is sad and not very appealing? You believe a pot is meant to contain something, like soil with flowers, or water turning it into a fountain. Most pots call to be filled. They have drain holes encouraging you to plant a favorite flower or shrub in them and they can provide super drainage. All good points! However, there is something special about a pottery left empty. Especially when you display it along an entry way to a home or deep in the center of a lush garden. Need something to add color, place one under a green tree and leave it empty. This emptiness draws your eye to it and let's your imagination soar. You wonder why? Why was it left empty. Is it being displayed like a piece of artwork? Maybe you are just leaving it empty temporarily until you figure out what you want to plant in it. Just know in your heart that it's OK to leave a garden pot empty. You don't always have to do the norm. Take your time deciding. Let it sit in a place where you can view it from inside the home and take your time deciding what to do with it. 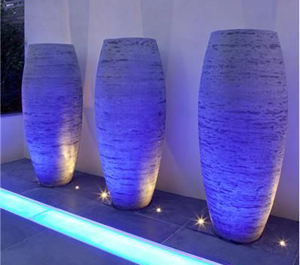 Purchase a bright blue pot and surround it with blue glass that reflects the light. 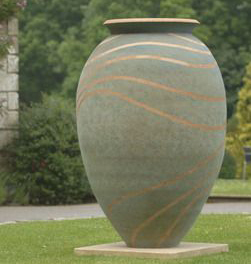 Add water and make it a water feature or leave it empty and just admire the color and beauty of the lines. Read more.....Consider climate when planting containers. Read more.....Compost made of what? 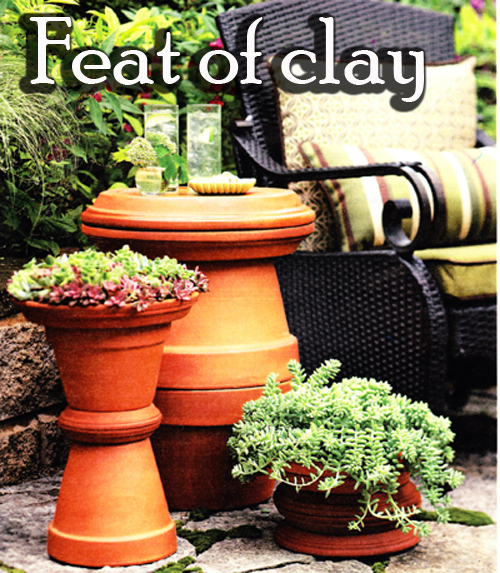 Turn inexpensive terra-cotta clay pots into fun, functional patio decor. All you need is glue! Make end tables and planter pedestals by stacking containers and saucers in creative combinations. Sketch out possible combinations, or play with pots you already have on hand, to find a design you like. Once you have the necessary pieces, assemble them without gluing to make sure the result is what you envisioned. Use craft adhesive to attach pieces. Run a solid bead on each surface to be glued. Then let the assembly dry complete. Use a pottery sealer if desired. Repotting & Potting-Up A Plant! Follow this step by step guide to transferring your plant without trauma. Because plants at garden centers and nurseries are often root bound, and because the soil mixes used are sometimes not ideal, we offer a few tips here that should make a big difference. Many times after bringing home a lush, lovely potted plant from your local garden center or nursery you will need to re-pot immediately for the best growing results. Many plant require regular potting up throughout their life times. 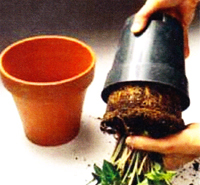 Taking a plant out of a pot and putting it back in the same or same size container is called re-potting. Taking a plant out of a pot and putting it into a larger pot is called potting up. Plants need potting up to keep their roots from compacting, a condition that harms most houseplants. Signs to look for when your plant need to be potted-up is slow growth, quick wilting after flowering, yellow leaves and small new leaves, and roots growing through the drain hole in the base of the pot. Check the roots of fast growing plants frequently to see if they are compacted. When potting-up, choose a pot one size larger than the pot the plant is now in. Make sure it's clean and has a drain hole. Cover the drain hole with pot pads or a shard from a broken pot so the soil doesn't drain out. Wet the soil the day before removing the plant. To remove it hold your had against the soil and around the stem, turn the pot upside down and tap the rim surface. Once it's loose, grasp the plant near the soil and pull gently. Keep the root ball as intact as possible. If the roots are tangles, lightly loosen the outer part of the ball with your hands or a knife, being careful not to damage the delicate roots. Place some soil in the new pot, then position the plant on top. Adjust the plant to leave enough room below the rim for easy watering. 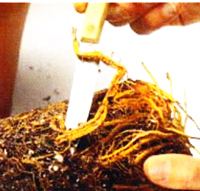 Fill with soil around the root ball, burying the plant to the same level. Tap pot, add soil as needed and then water. Read more.....Dig in with garden bulbs. 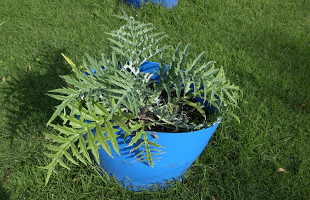 Did you know you can grow artichokes in garden planters? Try the "Purple Italian Globe" or the "Green Globe", two attractive plants that produce flavorful chokes. You should be able to find them at your local nursery or online. 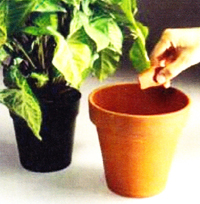 Plant them is a move-able pot or a planter that sits on a pot caddy for the best results. 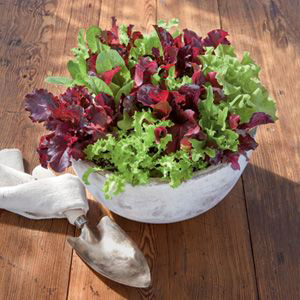 Sow organic lettuce seeds now in your favorite pottery on your patio or deck. Try these heirloom varieties that are slow to bolt in hold weather. Australian yellow leaf, red flame, and green Grandpas admire. You can find them at local nurseries or online. We love them in a decorative bowl that you can carry inside when you are ready to harvest some. Decorating your dining table is also a great way to display them. Yummy goodness. Sow some wildflowers. For a lovely spring display, scatter seeds now or plant in large garden bowls. Try chocolate flowers, desert marigold, firecracker penstemon, and globe mallow. Make sure the soil is weeded and tilled or use new hearty planting soil in the planter you select. Keep the soil moist once you sow the seeds and until germination. Try your local nursery for these also. Read more.....Let's grow lettuce in a garden bowl. It's hard to think about spring coming but now is the time to start planning and purchasing bulbs. Gather the pumpkins and create a welcoming display and plant your pansies. All fun and easy things to do this October in your home, garden or yard! Fall is the time to start planting bulbs such as daffodils, snowflakes, and Spanish bluebells. These spring blooms are some of the best perennials for all gardens. They are drought tolerant and long lived and will multiply in your yard. Plant them in a spot that will receive at least six hours of sun a day while the leaves are green. They can take a bit of dappled light but won't bloom in shade, so take heed. These bulbs like soil that is loose and well drained. Set bulbs twice as deep as they are tall, and water well after planting. Buy your bulbs at a local nursery or online and of course select a lovely new garden planter from us! Gather the pumpkins. These are so popular in October, and are found at local farmers markets, grocery stores and roadside stands. The new heirloom pumpkins are great is pastel colors and sizes. Select ones that are firm and unblemished. Keep them cool and dry and they should last for months. A popular look this year is the pumpkin stack using a garden urn or garden planter with feet. Use varied sizes and colors and create a fantastic entry piece. Just stacking pumpkins, colorful garden mums in orange, or red planters is lovely. 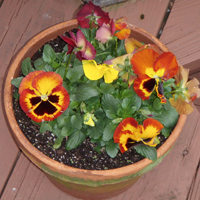 Plant your pansies.....Adding fall flowers to your garden containers and flowerbeds now allows roots to get established before cold weather sets in, so don't delay. Place transplants in a sunny spot in rich, well draining soil. When planting in pots, good drainage is very important also. Be sure the pot has drain holes. Try cold tolerant pansies like Plentifall. Other flowers to plant now include dianthus, snapdragons, calendulas, and discias. Read more.....The secret to bulbs. Potted Succulents Indoors For Winter..
Give Terracotta Pottery A Second Look..
• Containers that say "Welcome"
• What is a "spill" pot? • Grow your own Spa! • When To Water Your Garden Planters? • Pot Tips you can use everyday! • What is Talavera Pottery? • Why Should You Pot UP Some Mint? • What Pots Are Made Of. • How thirsty are your potted plants? • Still Talking Terracotta Pottery Tips! • Art on the patio or in the garden. • Talking Terracotta Garden Pots! • Can You Grow Banana In Flowerpots? • What Is Wrong With Your Potted Succulents? • What is Black Clay Pottery? • A Few Helpful Tips. • Need Help Transplanting Plants! • Houseplants & Bugs - UGH! • 3 Great Ferns to Grow Indoors. • Create A Living Christmas Tree! • Tips On How To Repair A Cracked Garden Planter. • Let’s Pot A Evergreen Tree! • How To Overwinter Geraniums! • Create a Driftwood Planter! • Let’s Clean Our Garden Planters! • Great Pottery Planting Tips! • What Can You Grow In A Flowerpot? • Veggies In Containers - Easy! • Tips For Successful Containers! • New Pot Tricks For Outdoor Planters. • Container Gardening for Food! • Fairy Gardens and Fun! • Gardening & Grandkids - Nothing Better! • What Is Your Garden Style? • All Season Centerpiece Project. • Patio Designs for the 21st Century. • Body Terrific Summer Berries. • Summer Veggies in Pots! • What To Plant Now! • Plant A Colorful Windowbox. • Add Some Outdoor Organizers! • Light up the Night! • A Tower of Herbs! • Empty Pots - Yeah...Empty Pots! • Repotting & Potting-Up A Plant! • Water Garden Do It Yourself! • Choose Pots for their Appeal. • Try Gravel As A Pot Topper! • Shrubs - Plain & Simple. • February in the Garden. • How to plant a BIG pot. • Compost Made Of What? • Bulbs, Beautiful & Easy! • Winter Windowsill Herb Garden. • January in the Garden. • Helping Your Garden Containers Thrive! • How To Make A Fountain Out Of A Garden Pot! • Why Grow in Garden Containers? • Create This Garden Planter! • November In Your Yard & Garden. 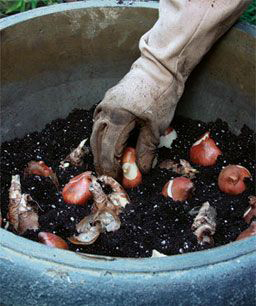 • Pot Up Your Bulbs NOW! • Maintenance in your garden planters. • Pot an Amaryllis NOW! • Turn Garden Pottery Problems Into Pleasures! • Guide To Re-Potting Garden Planters! • Pot Some Inner Beauties! • Make This Planter - I am easy! • A Trellis Hoop For Any Planter!! • Set the stage for a symphony. • Make This Garden Planter! • Container Water Garden Pots! • How Green is your Garden? • Veggies & Fruits together potted. • Super Strawberries in Pots. • 5 steps - Seed to Centerpiece! • May, Now What In The Garden? • Planting a mini cacti garden. • Steps for planting in a garden container. • Making A Patio Garden A Home! • Re-create Garden Planter Look! • Teach Children to Plant! • Outdoor Dining - work the elements! • What to do this March! • Orchid, Orchid who has an Orchid? • Pots and Winters Cold. • It only takes a few minutes. • Whats happening this February? • Bring Your Garden Indoors! • January - Now what do we do? • More....Cold Weather Container Ideas! • To Cold for Containers? NEVER! • Bulbs - Plant Them Now or Never! • Dreaming of Spring Color In Your Planters? • How To Clean Garden Pottery! • December - What To Do? • Potting Kale in Containers! • Placing stones in a garden area. • What Is Your Fav Houseplant? • Cluster Your Garden Containers! • Are you downsizing in this economy? • What To Do In June. • Need A Reason To Eat Your Own Strawberries? • Growing Herbs? Here are some suggestions! • Now That I have Planted - What Do I Do? • Pot Bare Root Trees NOW! • Spring Forward - Get ready for Spring now! • Do you have this problem? • More information about "The Secret to Bulbs"
• Grow your own backyard drugstore! • Nasa & Houseplants - Who knew?